What is your construction company’s level of preparation against a disaster? As a business or firm, you’re most likely aware of the many risks that come with construction projects. Whether it’s meeting the terms of a contract, maintaining employee safety on the job site, or dealing with natural disasters, every project has its own set of hazards. If not managed, these risks can hurt your construction projects and prove fatal to your bottom line. Thus, construction risk management is a must-have for any company. An effective risk management plan must have easy-to-follow yet detailed processes to help you control the risks, make decisions on how to deal with them, and turn them around to boost your company. With the presence of rising costs, new industry trends, more complex projects, and increased safety concerns, having a risk management plan is more crucial than ever. 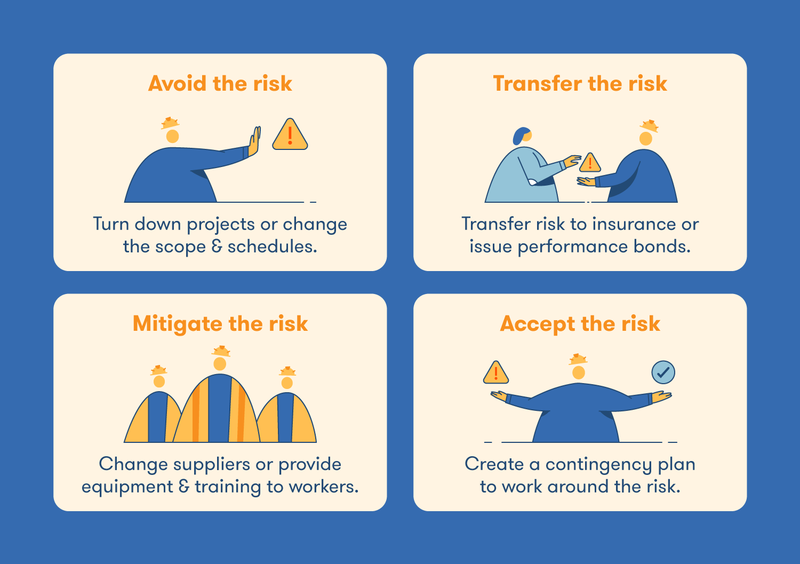 Read on for our guide on how to manage risk in your construction company. For a condensed version you can use for reference, jump to our infographic below. What is Construction Risk Management? Risk management is the process of determining the risks present in your business and evaluating the procedures to minimize their impact. In construction, the process involves planning, monitoring, and controlling instances of risk. As the center of the process is your risk management plan, a document that details the risks and your processes for addressing them. Safety Risk: Any construction site risks or hazards that can lead to worker accidents. Financial Risk: Factors that impact your financial flow, including lack of sales, problems with the economy, unexpected cost increases, and competition with other firms. Legal Risk: Potential disputes in the fulfillment of contracts with clients. Project Risk: Project hazards such as poor management of resources, miscalculation of time, lack of proper policies, or misunderstanding of project deliverables. Environmental Risk: Floods, earthquakes, and other natural phenomena that damage construction sites and make work inaccessible. In addition to these common mistakes, it is important to consider the impact of factors unique to 2019. This year will see an increase in trade tariffs and material costs, which could affect project budgets. Pressures for more building efficiency, prefab construction, and green construction could impact supply chains. New technology such as drones raises concerns over efficiency, while the increased selectiveness of insurance companies could change how you assign risks. Now that you know some of the most common construction project risks, it’s time to identify those unique to your project. Risk identification should take place during the preconstruction phase of the project to allow for time to manage any potential risks before accepting them. An effective way to analyze risks is to hold brainstorming sessions with your project team and stakeholders. The goal is to identify all the possible scenarios that could impact the project at hand. A brainstorm session will allow all teams to contribute their knowledge and expertise. Past projects can provide a helpful reference to understand size, scope, and location. After the brainstorm, you will then want to hold regular meetings with your project team. This will not help review current risk plans, but also identify any additional risks that may occur over time. Construction risks vary for each company — a risk that may affect another business might not be a concern for yours. After identifying your risks, it is important to prioritize them based on two factors: (1) the potential impact on your business and (2) the chance of that risk materializing. When possible, use numbers such as dollar amounts and percentages for risk analysis. High-impact, high-probability risks should be handled first, while low-impact, low-probability risks should be addressed last. For example, a price increase in the materials for your project can hurt your margins, so it should be handled with medium priority. Natural disasters have high impact but have low probability. If a hired contractor is unable to fulfill their portion of the project, that risk is an example of one with high impact and high probability. 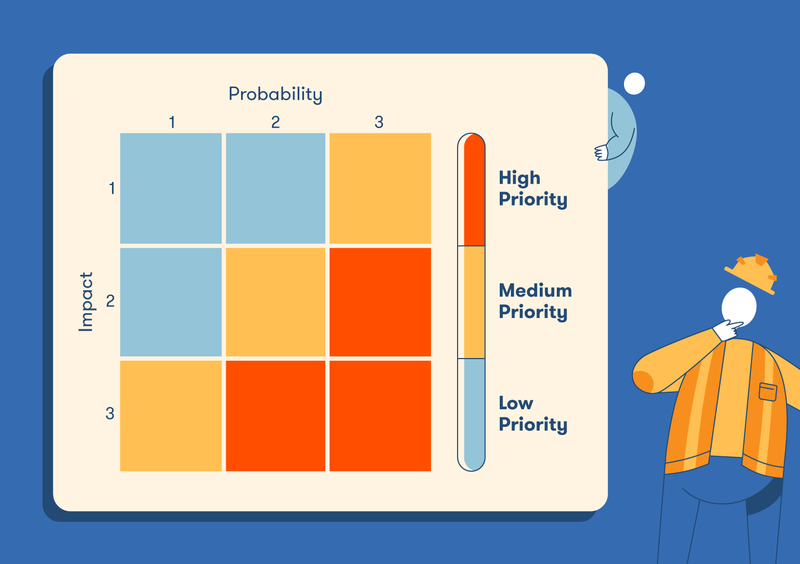 Creating a 3×3 priority grid like the one below will help you determine the risks most crucial for managing. Avoid the risk: If you feel unequipped to handle a major risk or do not have the right risk plan set in place, the safe option is to steer clear of the project or change the scope. For example, you may want to avoid building projects in areas prone to earthquakes. Transfer the risk: While costly, this solution may ultimately be less costly than accepting the risk itself. For example, you could transfer the risk to your insurance provider or forge an agreement with a supplier or subcontractor to pass the responsibility. Mitigate the risk: When you mitigate risk, you create plans to keep the risk as low as possible. You can train workers and supply proper safety equipment to lessen the dangers of safety risk, for example. Accept the risk: There are times where you need to accept the risks to complete a project. For example, you may decide to accept the delays caused by weather but you plan to manage the project better to work around the problem. The response strategy you choose will depend on your resilience to the risks and the potential rewards from the project. You may determine that a higher reward — such as gaining a loyal repeat customer or the opportunity to break into a new market — may be worth the higher risk. After conducting a risk assessment, you’ll then want to craft your risk management plan. A risk plan optimizes your risk response strategy, detailing crucial information for team members and providing a set of solutions to either mitigate, transfer, or accept the risks. In addition to stating priority, an effective plan should detail resources for each of your defined risks. Strategy: managing risk at the enterprise level, using indemnity clause in insurance, using risk as a means to improve profit margin. Operations: setting a process to review risks, creating a safety culture and program, manage subcontractors and vendors, preparing comprehensive documents. Software: The right cloud-based construction management software can help you manage and process tasks quicker, including building design, costs, safety compliance, and accounting. 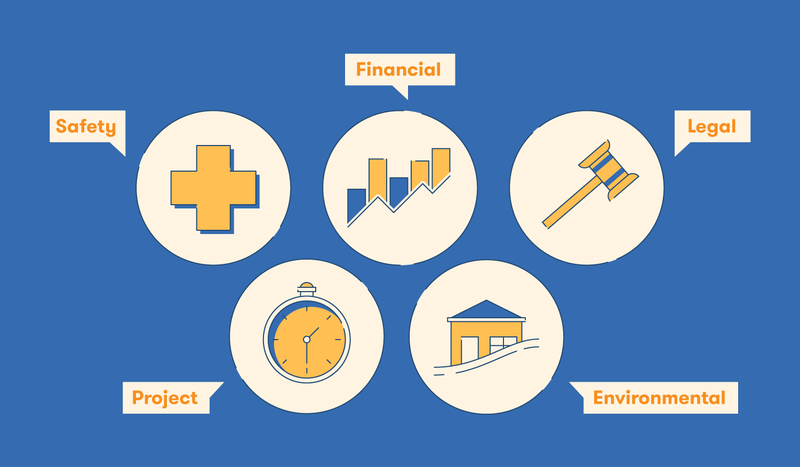 These functions help to mitigate risk as you handle an increasing number of projects. Financing: Construction business credit lines often provide a good precaution if you decide to accept various risks. Professional advice: Legal firms that specialize in construction contracts, as well as bankers, accountancy firms, and consultants, are good sources of advice from professionals for businesses. Your insurance program can also advise you on requirements and the pros and cons of different programs. Technology: The use of new innovations such as drones, BIM, and prefabricated building methods can help mitigate or eliminate common risks such as poor time management, safety hazards, weather. Construction risk management is not a siloed activity — it must require the contribution of the major players in your company. Updates on risk should be communicated at every level. The three key players who participate in the construction process are the owner team, design team, and contractor teams. Since each team has its own set of practices and procedures, it is important to look into their processes and identify and eliminate risks wherever possible. The stakeholders also play an important role that can impact risks. The types of information to monitor include cash flows, drawings and diagrams, schedules and cost information, inspections, project files and logs, contracts, and regulatory documents. With any risks that you decide to accept, you’ll want to create a contingency plan — an alternative method for finishing a project despite accepting the risk. For example, if your company decides to accept a project that provides a considerable amount of safety hazards, you’ll want to communicate those hazards to workers. Your contingency plan would provide solutions such as providing a list of chemicals, labeling all containers, and using software that allows workers to check off safety precautions. Risk management is not a set-and-forget process. Consistent monitoring and revisions to your plan will help increase the resilience of your business against any possible risk. Like a dynamic document, your plan should evolve and change over time. Even after all risks have been calculated and accounted for, residual risks often remain due to unknown factors. Risk transfer and risk acceptance are common response strategies to respond to these risks. By now, it should be evident that a risk management plan can provide your company with great ease and security. While building out a plan requires a lot of effort, effective risk management provides some essential benefits for your company. Once a risk management plan is set, it helps make your future projects easier to assess. Team members have the knowledge and tools needed to make decisions and avoid risk, improving the efficiency of your company. Risk management plans also help teams follow all safety and security standards on construction sites. The possibility of a safety hazard is minimized, moving projects along faster. Being equipped with a sound plan allows teams to gain confidence over time in their projects over time as they balance risks. Since they are able to plan and fix any mistakes, teams can save time and resources in their projects. Taking on unmanaged risks can hurt your company’s profits. However, a carefully-crafted and actionable risk plan helps to minimize these risks. 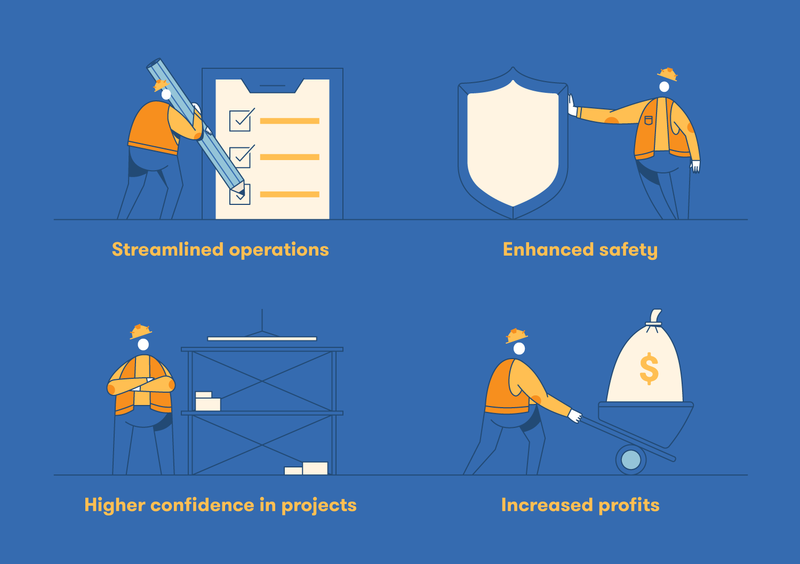 Streamlined operations, enhanced safety, lower costs, and higher project confidence leads to increased profits over time. Along with the actual building process, risk management should be seen as one of the most critical steps of a construction project. The steps of identifying, assessing, controlling, and monitoring risks will make them work for your company. Not all risks are negative. Positive risks come with accepting a second project from a customer, for example. By setting the right strategies and using the right resources in your management plan, your company will not only defend against any disasters but also take advantage of new business opportunities. 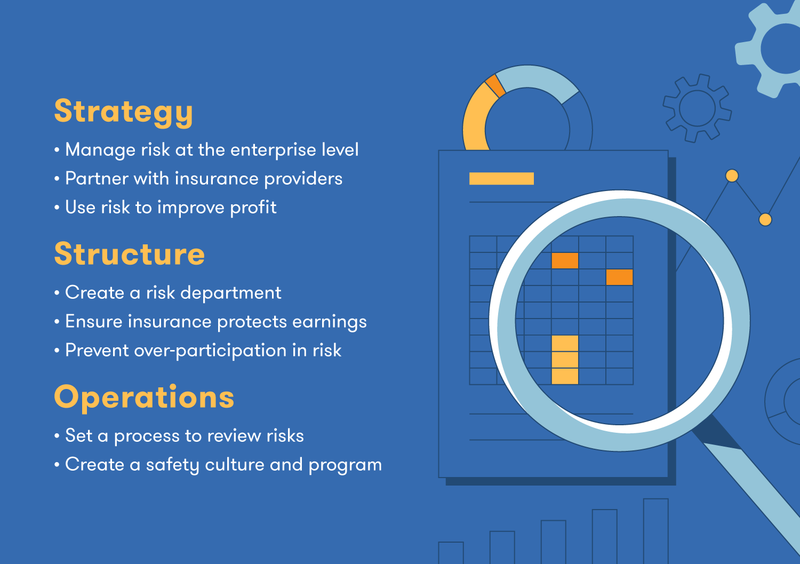 See our infographic below for a quick reference of the risk management process. How Much Real Estate Do Retail Chains Take Up? There was a problem while loading the Express Book module - please try again later. © 2019 BigRentz, Inc. All rights reserved.